Rising out of Chicago as a leading light of the drill movement, Lil Durk has matured into one of the most emotionally and melodically sophisticated rappers in the game. 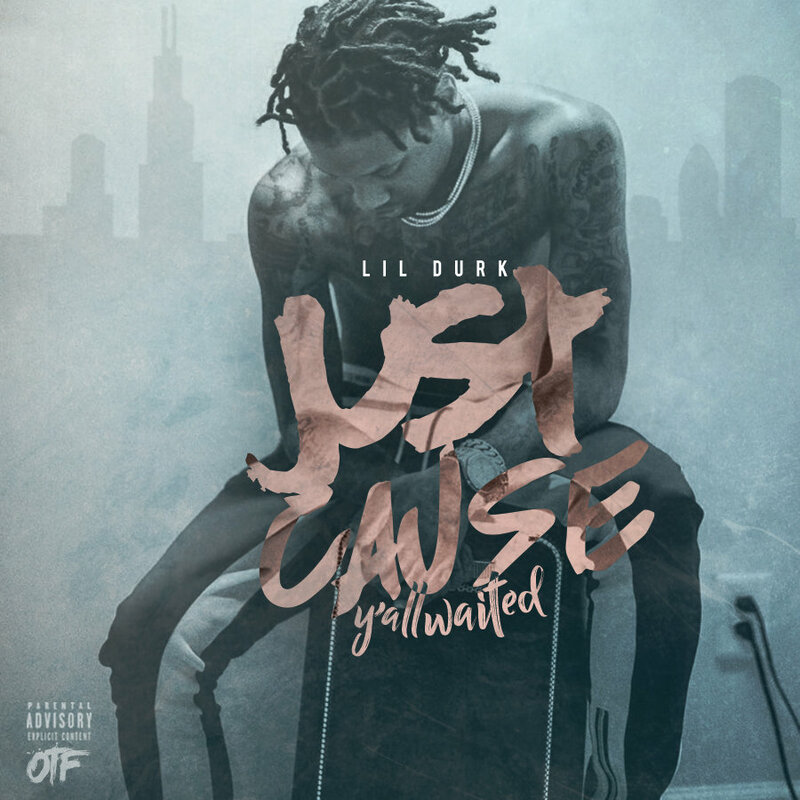 Sharing a gift for his hungry legion of fans, Durk announces Just Cause Y’all Waited EP, his first project since leaving Def Jam Records. 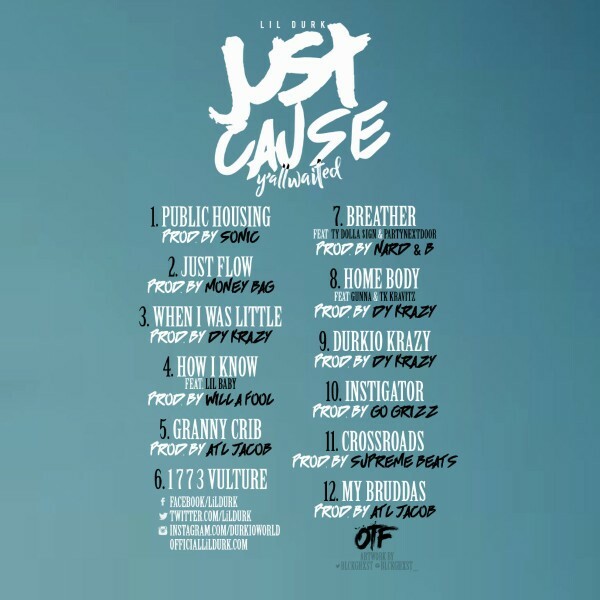 Further evidence of Durk’s seamless fit within Atlanta’s vibrant scene, Just Cause Y’all Waited is a nine-track pack of melodic bangers, with Durk providing tuneful hooks over booming trap production. A formidable appetizer for Durk’s upcoming Signed to the Streets 3, Just Cause Y’all Waited features previously released tracks such as the DY of 808 Mafia-produced “Durkio Krazy,” which has over 5 million combined plays for its audio on YouTube, the buzzing “1-773 Vulture,” a street remix to Logic’s hit single “1-800-273-8255” that reached the 7 million view mark on YouTube, and the Bone Thugs-N Harmony tribute “Cross Roads,” which has over 3 million combined plays. Featuring appearances from PARTYNEXTDOOR, Ty Dolla $ign, Lil Baby, Gunna, and TK Kravitz, Just Cause Y’all Waited EP releases on March 30th. To accompany the EP announcement, Lil Durk shares the video for “How I Know” an emotional and paranoid new anthem. Featuring an appearance from Lil Baby, whose plaintive rap-singing complements Durk’s soaring melodies, the Will A Fool-produced “How I Know” finds the two rappers trying to figure out who they can trust: “How I know if you’d die for me/Know if you’d shoot for me/How I know you still love me?” In the video, premiered by Billboard, the two emcees count cash in a dark room, sitting on the hood of a Bentley, with Lil Baby decked from head to toe in Balenciaga. After a busy 2017, Durk looks to sustain his momentum throughout another great year. The OTF spitter turned heads this past December with Bloodas, an album-length collaboration with Detroit rapper Tee Grizzley. Earlier in 2017, Durk teamed up with fellow Drill movement rapper Lil Reese for their Supa Vultures EP. 2017 also cemented Durk as one of Hip-Hop’s most prolific collaborators, appearing on Young Thug’s EBBTG, Trae Tha Truth‘s Tha Truth 3, Mozzy‘s 1 Up Top Ahk, and Ralo x Gucci Mane‘s Ralo LaFlare. Fans can stay tuned for Just Cause Y’all Waited and Signed To The Streets 3, slated to release this year. Please contact Michelle or Dharmi for more info.